Dale Jennings was born today, October 21, in 1917. He was an American LGBTQ rights activist, playwright, and author. He published three novels, one of which, The Cowboys, became a film starring John Wayne. The New York Times called Jennings a "pioneer in the gay rights movement." Jennings was born in Amarillo, Texas, and grew up in Denver, Colorado, where he studied the piano. He and his sister made many appearances on local radio and at tent revival meetings. Dale showed an early love of dance, growing into a noted prodigy before the age of 12. In his late teens he moved to Los Angeles, with aspirations of becoming a writer and theater director, for which he had trained in Colorado. He eventually launched a theater company called the Theatre Caravan, located in a now demolished building near Olympic Blvd. and Alvarado, where he also lived. During this time he wrote and produced about 60 plays. During World War II he was stationed at Guadalcanal. During his military service, he was awarded a WWII Victory Medal, an American Campaign medal, an Asiatic- Pacific campaign medal, and a Philippine Liberation Ribbon with one bronze star. After being honorably discharged in 1946, he returned to California where he studied cinema for two years at the University of Southern California. Before the war Jennings pursued relationships with women in the custom of the time, to avoid any suspicions about his true nature. He married once, an aspiring actress at Theatre Caravan; this lasted through the war, followed by divorce. In November 1950, Jennings accompanied his then-boyfriend Bob Hull, to a meeting that would change his life. Mr. Jennings's place in American political history was etched on a November afternoon 50 years ago, when he sat on a Los Angeles hillside with four other men to talk about forming a group to work for gay civil rights. 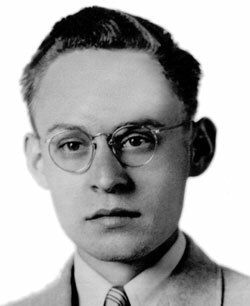 The idea was the conception of an American leftist and trade union organizer named Harry Hay, and the organization that resulted was the Mattachine Society, the Nation's first enduring gay rights organization. The Mattachine Society sought to gain acceptance through greater communication between homosexuals and heterosexuals. In the spring of 1952 Jennings was arrested for allegedly soliciting a police officer in a toilet what is now MacArthur Park. The trial that took place drew national attention to the Mattachine Society and membership increased drastically due to the decision to contest the charges. Most homosexuals at the time pleaded guilty so as not to be publicly scrutinized. His decision to fight back was a pivotal point in the movement. The organization raised funds and promoted Jennings’ case nationally. The trial began June 23, 1952, and lasted 10 days. Jennings confessed to being a homosexual but denied any wrongdoing. While there were different accounts of what exactly occurred that day, by the end of the trial the jury voted 11–1 for acquittal on the basis of police intimidation, harassment, and entrapment of homosexuals. The case was dismissed. Jennings and a small group of members from the Mattachine Society formed a separate organization called ONE, Inc., which became the dominant organization in Los Angeles and its magazine became, for a period of time, the voice of the gay and lesbian movement. The magazine spoke out openly and more forcefully on behalf of the rights and interests of homosexuals. The magazine was the only publication that openly spoke positively of homosexuality and fought for equal legal and social status for homosexuals. The small circulation but large impact of this magazine represented a lot of the small organizations that were also a part of the movement. While small in number, each member of the movement symbolized an insecure and emerging movement among homosexuals that confronted their subjugated status in society. Jennings wrote and published his first novel, The Ronin, retold from an ancient Buddhist story, followed by The Sinking of the Sarah Diamond. Another book, The Cowboys, based on a film treatment he sold to Warner Bros., caused considerable controversy among publishers due to its glimmers of homoeroticism. It was made into a film in 1972, starring John Wayne. Jennings died of respiratory failure on May 11, 2000, at age 82.